If you need a new roof for your house or you’re building a new home and considering the best option for the type of roof you’ll need, you’ll need to consider the different choice options available to you and in what the pros and cons are for each style. A roof can make or break the exterior look of your home. The style, the colour, the finish and what weather types it’s best suited to are all factors you’ll want to consider. You’ll want to make sure that you choose an option that keeps out the weather, protects your family, seals off your home from pests and also looks great, too. As a homeowners you may not be a roofing expert. The average person would probably have a tough time distinguishing one style of roofing from another. In fact many people don’t know which roof type is best for their location. So how do you choose the roofing style that best suits your needs? Luckily the experts here at Bondright roofing have written this handy article to help inform you of your options! Style: A gable roof forms a triangle, with two sides meeting at the roof’s highest point. A cross gable roof structure consists of two triangular gables forming a 90-degree angle. Pros: Simple design, easy to construct and less expensive and more spacious than an alternative roof style, such as a hip roof, they also have great ventilation and water drainage capabilities which make them less prone to leaks. 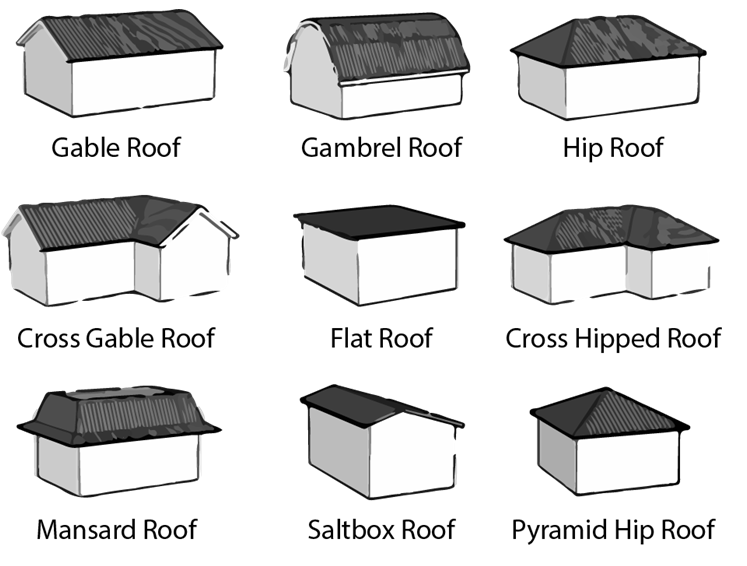 Cons: Perhaps one of the biggest cons of gable roofs is that they are more prone to wind damage, as they tend to be more steeply pitched than other roof types. Style: Cross gable roofs have two or more gable roof lines that intersect. Pros: See gable roof above. Cons: See gable roof above. Style: Hipped roofs have four slopes of equal length on all four sides that meet at the top to form a ridge. Pros: More stability and durable than gable roof, they are spacious and are an excellent choice for both high wind and snowy areas. The slant of the roof allows snow to easily slide off with no standing water. Style: Cross hipped roofs are comprised of two hipped roofs that intersect with one another, usually forming either an L shape in which the two hips intersect at their ends or a T shape, in which they intersect in the middle. Style: Pyramid hip roofs have four sections that come together in a peaked tip. Each side slopes down towards the walls and has at least three rectangular faces. Because of their shape, they’re more aerodynamic than other roof types. They also have natural insulation and drainage capabilities. Pros: Extremely resistant to strong winds and they are great for rainy areas as the water drains easily from them, they are spacious, energy efficient and they have great ventilation. Style: A flat roof, just as the name suggests, is laid horizontally though it may contain a minor incline. Synthetic rubber & asphalt are the two most common flat roofing materials. Pros: Reinforced flat roofs can be used as roof gardens, they are cheaper to install than other roof types and can have solar panels, heating and cooling units can be kept on them which is great for commercial roofing they are also energy efficient and environmentally friendly as they are easy to insulate. Cons: Maintenance and frequent repair costs can make them more expensive in the long run as they are often prone to leaks. Style: Unlike other roof types, shed roofs are single planes that slope downward. Shed roofs are used in homes that have one higher wall and one lower wall, and are also used to connect homes with lower porch roofs. Pros: Lower costs to instal, easy to repair and easy to fit. Cons: Maintenance is high as you have to repair frequently, they look cheap, they don't lend themselves well to weather of any sort and they are environmentally unfriendly as they are not well insulated. Style: A mansard roof, also known as a French roof, is a four-sided roof with a double slope on each side that meet forming a low-pitched roof. Pros: Extra living space for attic rooms, they are aesthetically pleasing, they lend themselves to later additions of dormers or garrets. Cons: They do not lend themselves well to heavy snowfalls and construction costs are the two main cons of Mansard roofs. Style: A gambrel roof has two slopes, one is steeper and the other is shallower. The name gambrel gets its name from the back portion of a horse leg or ankle of a horse. The roof is commonly seen in houses and large farm buildings. These roofs are easy to frame and have an excellent drainage capability. Pros: The roofs can be easily constructed and allow more space for an upper floor, they aren’t as expensive to construct as other roof types and they look stylish too. Cons: These roofs are not ideal or advisable in areas that experience snowfall, heavy winds, and heavy breezy weather as they are not durable enough for these conditions, they also require frequent maintenance. Style: A saltbox roof is asymmetrical in design, with one side being more of slightly sloping flat roof and the other more of a lean to, with gables at each end. Pros: Great for heavy rain as it is easy for water to run of, the asymmetrical design makes it more durable than a simple gable roof and they can be good for attic rooms as they add additional height to a roof. Cons: Building costs are higher due to complex design and although more living space is provided, it isn’t as much as a regular pitched roof. Style: Dormers are roof additions that extend above or out of a home’s current roof, allowing properties with limited space for expansion to build upwards. Dormers offer more light (they often have windows), higher ceilings, and can even add some additional space to attic rooms. Adding dormers to your home can add value, character, and attractiveness, both inside and out. Pros: They are very appealing to look at and add character, they add light to an attic room, they improve ventilation in your attic, they provide a lovely view and they are another potential exit in an emergency. Cons: They aren’t great in adverse weather condition areas, they aren’t as durable as other roofing types and demand frequent maintenance, They tend to create valleys on either side which are prone to developing leaks. Sappi Roof: Sappi roofing is a polymer bitumen waterproofing membrane. This membrane is applied to a variety of roofs: flat, curved and pitched. Applied by using a torch on method the membrane has a low melting temperature which makes it easy to bond, which also reduces the gas consumption required to install the system. Pitched Slate & Tile Roof: Wherever you go into the UK, you’re bound to see pitched roofs, the most common design for houses. Using both slates and tiles, Bondright Roofing can create colourful and durable rooftops for any homeowner and their family. Matrix Roof: Matrix roofing was originally developed for use in ship building, it uses Glass Reinforced Plastic (GRP) to provide a hard-wearing easy to install roofing solution for any roof, but is more commonly used for flat roofs and complex roof designs with lots of protrusions, such as skylights. If you need help or advice with your flat roof call us today at 01491 579 659 or get in touch to schedule a visit.